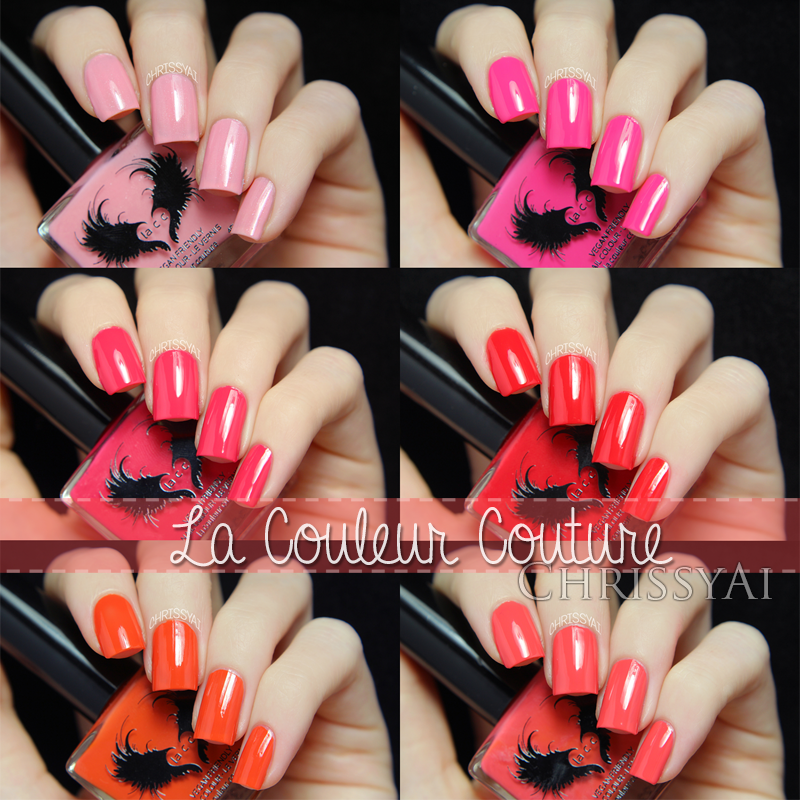 Today, as I'm sure you can tell by now, I'm showing you guys a part 1 of my la couleur couture swatches. I kept the details short in this post because all of the polishes applied basically the same. The formulas were very workable and the I love the brushes, they make application quite enjoyable! The colors are so vibrant and gorgeous, I honestly don't have any complaint about them! If you've read my blog for a while, then you probably know I'm not the biggest fan of pink. However, all of these colors have had me drooling! I can't pick out even one that I don't like. For those of you unfamiliar with the brand, "la couleur couture is a unique vegan friendly nail lacquer collection formulated without toxic and harsh chemicals like formaldehyde, formaldehyde resin, dibutyl phthalate, camphor and toluene." You can read more about la cc here. 1945 is a vibrant true red creme. 1950 is a vibrant hot pink creme. 1957 is a delicate light pink with silver flecks of shimmer. The shimmer is so subtle but shines through beautifully in person, especially when the light hits it! 1960 is a vibrant pink creme with a touch of coral to it. 1963 is an orange coral creme. I ended up liking this shade a lot more than I thought I would! It's a really fun color and perfect for the season! 1964 is a dusty orange creme. Wow... gorgeous colors and swatches!! And this is only part 1? Oooh can't wait to see part 2! Love how bright most of them are! Wow, beautiful polishes. I like all very much.